Responsibly empowering lifelong learning for the residents of the City of Jamestown. The James Prendergast Library was a gift to the city from Alexander Prendergast, the city founder’s son and his wife, Mary. They commissioned the building in memory of their son, James Prendergast, who died in 1879 at the age of 31. The library was completed at a cost of $60,000 and was furnished with an art gallery at a cost of $45,000. It opened December 1, 1891 and contained 8,666 volumes. As library services and use increased, extensive alterations and additions were planned. These were completed in 1960 and the original building now houses the offices and meeting rooms. The former Reading Room contains the original oak fittings and red tile fireplace. 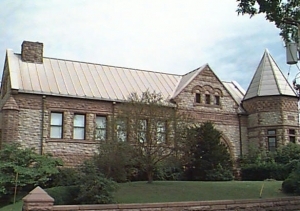 In 1960, the library joined and became the major central library of the two-county regional Chautauqua-Cattaraugus Library System. In 1964, the library’s public services were moved to a new addition, whose entrance is on Cherry Street. Other major building additions were completed in 1968 and 1978.